In 2011, the Connection Revolution helped thousands of dreamers blossom into world-changers, in small and large ways. Not everyone here is interested in all three of these, and that’s totally fine. Just focus on what’s relevant to you in your life right now, and skip over the rest. Through over 100 blog posts / newsletters / videos, we helped you live a more authentic and connection-filled life. With Profitable Idealism, we helped you change the world with your business. With the 2nd Annual World-Changing Writing Workshop, we helped you change the world with your writing. With The Way of the Peaceful Entrepreneur, we helped you stay peaceful while building your business. With our coaching programs, I (Pace) helped you find your path in life, and Kyeli helped you establish a world-changing writing practice. Our earlier work, like The Usual Error, 52 Weeks to Awesome, and The Connection Manifesto, continued to help others as well. The largest light-blue slice is the World-Changing Writing Workshop (WCWW). It helped a lot of people a medium amount. Coaching (purple) and blog/newsletter (orange) are the next largest two slices. Coaching helped two handfuls of people a great deal, and the blog and the newsletter helped a huge number of people a small amount. “UE” is The Usual Error, “52WtA” is 52 Weeks to Awesome, and “PI” is Profitable Idealism. It’s hard to measure this, but it’s worth the effort. It keeps us focused on our main goal, which is to change the world. The Connection Revolution is a movement, and it’s also a business. (Here’s why.) In the spirit of openness and connection, we’d like to tell you about the business side of things. Here’s a breakdown of how much net profit we made in 2011. 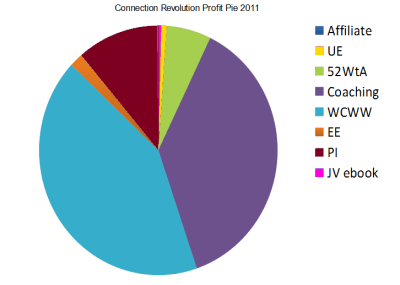 If you’d like to compare the profit pie and helping pie for 2010, you can see them here. The two biggest slices are the World-Changing Writing Workshop (light blue) and coaching (purple). It’s nice that these are two of the biggest slices of the helping pie, too; that means our profits are aligned with our goals. The business is almost but not quite to the point where it could fully support our family of 3. In the meantime, I’m still working 50% time at my day job. These pies help us do more of what’s working and less of what’s not. We’ll continue posting in the blog and writing/videoing for the eZine. We now only write (or video) one article per week, but we’re doing our best to make that weekly article as helpful as possible. This summer, we’ll be teaching the 3rd Annual World-Changing Writing Workshop (WCWW3)! We’re excited to tell you all about it soon! We’ll be doing fewer joint ventures so we can focus on our own Great Work. WCWW3 may be the only course we teach with guest speakers this year. We’ll find other ways to build connection in our community, though — starting with the World-Changer of the Month award. All subscribers of our eZine will be able to participate in a group discussion each month with the recipient of the award. And we’ve got some ideas for using our Facebook group to help you connect with each other. Speaking of those surveys, here are the results of the “Who are you?” survey! Your responses really touched us, and they’re helping us make the Connection Revolution be of service to you in 2012 and beyond. We won’t share the sweet and amazing things you wrote because many of them are very personal (despite being anonymous) but here are the results of all the tickyboxes that everyone ticked, sorted by the percentage of people who ticked it. If you take the top 10 most ticked tickyboxes and squish them into two imaginary people, you might get an emotional writer/artist who loves to read and has big dreams and a spiritual visionary teacher/entrepreneur who wants to change the world. If you attached imaginary nametags to these two imaginary people, they might read, respectively, “Kyeli” and “Pace”. < I thought I was a good person, but I’ve just hurt someone I care about. What’s wrong with me? > Announcing the VIP Writing Apprenticeship Extravaganza!